Custom Hand Sanitizer Gel Packets, personalized in bulk. Promotional, Inexpensive. Budget Prices in America. 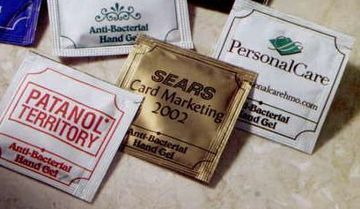 Bulk personalized antibacterial gel packets, with optional fast production (see the Price Table). The wholesale custom imprinted gel packs are a perfect small, ‘go anywhere’ item. Can be used anywhere, any time. Your clients or employers will appreciate the thoughtful gift of a healthful, convenient, super cleansing antibacterial hand gel packet. Free artwork design. We will send you a proof of the imprint on the hand sanitizer pack before production. Budget Prices in USA snd Canada for wholesale personalized hand sanitizer packs. American clients pay no taxes. Unit prices below include your custom imprint in up to 3 colors. Setup charge $50 per color, up to 3 colors. Rush Production Time: 3 days: add $0.07 per pack. Production Time: 10 Business Days ; #-Day production is available: see the Price List below.